Yeaaaaaaahhh. Now that's what I'm talkin' about! Paradise by the oven light. Actually I feel ridiculous putting up a meatloaf recipe. In my mind, acquiring knowledge of meatloaf happens in one of three ways: 1) you get the recipe from your mother; or 2) you get it from some other significant person in your circle of family and friends; or 3) you buy a pound of ground beef and think "how hard can this be?" and after successive trial and error, you arrive at your own personal meatloaf that you then make by rote until someone asks you how. Then you think about it. I made meatloaf the way my mother taught me, which was via a series of notes left on the kitchen counter when I was growing up as a latchkey kid. "Pr--h--t ov-- to 350 a 5:00," was always at the top (my mother had terrible handwriting and she was always scribbling these notes in a hurry). Sometimes the dry ingredients had been laid out for me, sometimes not. "Gr---d b--f in frig. 2 egs. 1/2 cup br--dcr---bs..." The last direction was always to open a can of Campbell's tomato soup and spread it over the top of the meatloaf. Why? I never thought to ask why until later years, and my mother shrugged and said that's the way her mother had done. I accepted that, and in later years I went from tomato soup to just plain ketchup as a top glaze. Why? I don't know, maybe I didn't have the soup one night, made do with the ketchup and liked it better. This is how these things happen. There's turkey meatloaf, and ground beef meatloaf Some will say if you're going to do it, then do it right and use a mix of ground beef, ground pork and ground veal. My friend Lisa swore Martha Stewart's recipe for All-American Meatloaf in the same book Favorite Comfort Food is really good. It calls for 1/2 pounds of beef, veal and pork. I've used that and other times I've used turkey and it all comes out good. Set a fine-mesh baking rack in an 11x17 inch baking pan (I have neither of those things, honestly, Martha, you piss me off sometimes). Cut a 5x11 inch piece of parchment paper, and place over center of rack to prevent meat loaf from falling through (ignore, ignore). Using your hands, form an elongated loaf covering the parchment... OH FOR THE LOVE OF GOD, MARTHA! Shape the damn loaf and put it in your meatloaf pan or your baking dish. Done. Honestly. This isn't rocket science. You know what? She lost me at "parchment paper." This recipe is a production. It's Monday night, I'm tired, people are hungry. 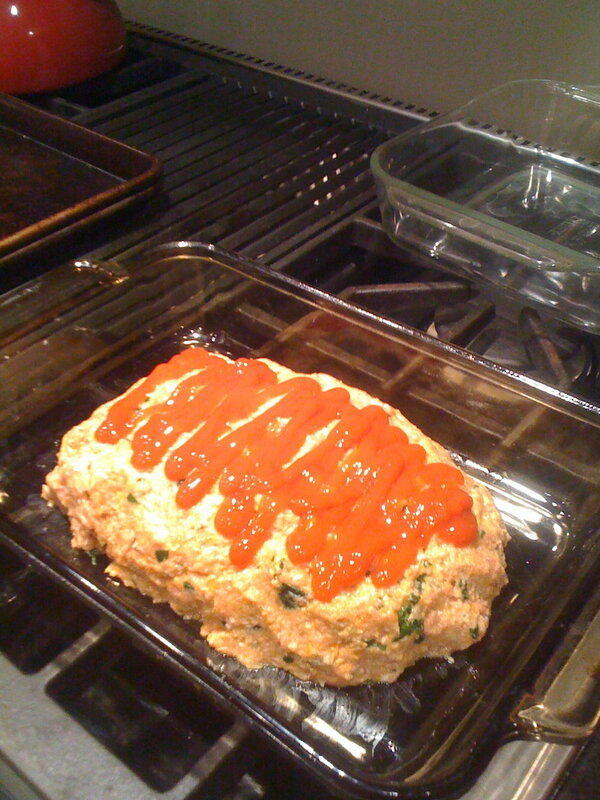 I'm spreading Heinz ketchup over the top of my meatloaf and calling it a day. Bake 50-55 minutes at 400. Let cool 15 minutes and serve. Serve with what? How about Trader Joe's mashed potatoes and the last of those little baby carrots I got at DeCicco's, which failed so miserably in the crockpot? I trimmed and peeled them, tossed them and my other 1/2 onion with olive oil, salt and pepper, and added them to the 400 oven halfway through cooking. Oh wait, I lied... I don't have the mashed potatoes. How about Alexia waffle fries? Yes? Nod your head at me. Yes. Good? Don't lie. OK. Thank you.